A team of Engineering Students from Uxbridge College have won a London-wide competition run by Transport for London (TfL) and sponsored by Cleshar. Team Spectre triumphed out of a total of 20 teams by designing an app for use by TfL customers. The students were praised for the quality of their product, as well as their teamwork and communication skills. A group of students from the College’s Business School, Team Falcon, were also one of the four teams who won through to the finals. The competition, the TfL Schools Challenge, took place at the Institute of Mechanical Engineers, and students were asked to come up with an idea which would help keep London moving. Both teams have now secured work experience at TfL as a result of their participation, which is expected to take place later this year. 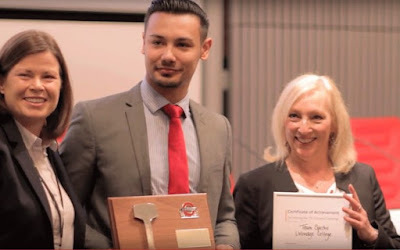 Photo caption (l-r): Uxbridge College student Alex De Oliveira from winning Team Spectre and Executive Director Enterprise & Development, Lorraine Collins (right), pictured with Tricia O’Neill, CEO of Cleshar. ← PwC webcast: Global and UK Economic Outlook – How secure is the recovery?